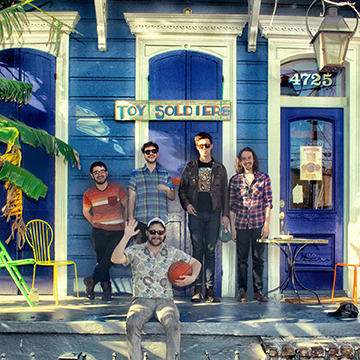 We got the chance to talk to Dominic Billett of Toy Soldiers. In our interview we discuss their newly released album, “The Maybe Boys”, as well as the tour and a lot more! Roots rock n’ roll, psychedelia, R&B, soul, dixieland. Utilizing all of the colors of the American music heritage palette. We don’t pigeon-hole ourselves into sounding like one particular thing. All of our musical influences are vast, and we pull from that as much as possible—creating a sound that is Toy Soldiers. We just spent a week traveling in support of our album ‘The Maybe Boys’ up and down the Northeast coast—from Lancaster, to New York, to Boston, back to Philly, and up to Rhode Island. Each show was great, especially our hometown (Philadelphia) record release show. MidPoint Music fest in Ohio is definitely a stand-out gig, along with doing a Daytrotter session in the OG studio in Rock Island, IL. Surreal! Its an honor to be noticed by such a reputable source. We love a good live show, so we’re looking forward to living up to that honorable mention. Nothing in life being certain. The long, confusing path to becoming a (not even) semi-successful musician. Scrapping your only mode of transportation in New Orleans and maybe getting home. Or: Luke’s interpretation of us as guys, ‘The Maybe Boys”. Ron comes from a background of professional Karaoke singing. His old K Boy band was called ‘Soy Toddlers’. He decided to change it to ‘Toy Soldiers’ when we all joined and played real instruments.